Take a Ride with “the Boy” Through the Heart of the Last Great Era of Hard Rock! Drumming phenom Bobby Rock takes you behind the scenes to the genesis of his extraordinary musical journey: from the moment he decided to become a drummer, to his fanatical practice and training regimen, to the destined path that led him from Houston to Hollywood—during the height of the 80s hair metal explosion—for a fateful audition with ex-Kiss guitarist’s, Vinnie Vincent Invasion. 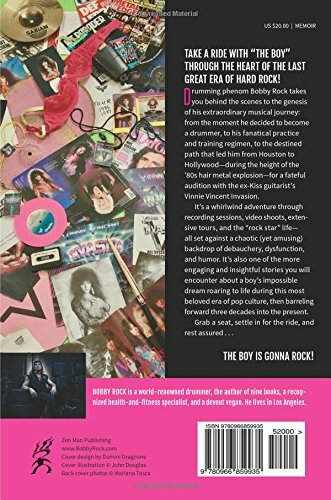 It’s a whirlwind adventure through recording sessions, video shoots, extensive tours, and the “rock star” life—all set against a chaotic (yet amusing) backdrop of debauchery, dysfunction, and humor. It’s also one of the more engaging and insightful stories you will encounter about a boy’s impossible dream roaring to life during this most beloved era of pop culture, then barreling forward three decades into the present. Grab a seat, settle in for the ride, and rest assured… The Boy Is Gonna Rock! 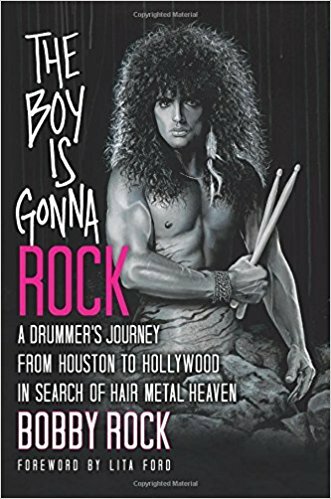 Bobby Rock is a world-renowned drummer, the author of nine books, a recognized health-and-fitness specialist, and a devout vegan. He has recorded and performed with a variety of artists, including Vinnie Vincent Invasion, Nelson, Slaughter, Rare Earth, Brett Garsed, Neil Zaza, Gary Hoey, Hardline, Nitro, Scrap Metal, and Alcatrazz featuring Graham Bonnet, and is currently touring and recording with Lita Ford. He has also released several recordings and toured extensively as a solo performer, and is recognized as a top drumming educator.